Apple iBooks has just published (1 September) a new book by Prof. David Kennedy with Rebecca Banks and Emergent Form's Paul Houghton on Kites in 'Arabia'. Edit 25/20/2016 - the iBook is free to Download. The book offers an approachable survey and analysis of the stone built structures known as Kites found throughout Arabia - the huge arid region extending from south-eastern Turkey through Syria, Iraq, Jordan and Saudi Arabia to Yemen. The volume examines Kites from their first discovery by the RAF pilots who were the 'Pioneers' of aerial photography in the inter-war period in Transjordan to recent research and interpretation conducted by various professionals in the field. Distribution, form and function of the Kites is discussed and extensively illustrated with references provided throughout. 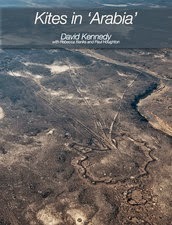 The volume benefits from David Kennedy's long established interest and passion for aerial photography and archaeology in the Middle East, and draws on the extensive reconnaissance performed by the Aerial Archaeology in Jordan Project and historical imagery research of the APAAME Project. The book also includes extensive appendices illustrating types and locations of Kites across 'Arabia', and historical accounts of Kites by early explorers in the Middle East. The medium of iBook was chosen for two primary reasons: accessibility and inclusion of illustrations. We have made the iBook available for just US$4.99/ AU$5.99/ £2.99 to make the publication affordable. Images have been profusely included to illustrate the features described, something that would have astronomically increased publication costs in a printed edition. Moreover the electronic format allows for interactive features which enhance the illustrative elements and for video interviews and footage taken from the helicopter. Heavy on content, the iBook does come out at roughly 1GB to download, but fortunately will only ever be as heavy as carrying around your laptop or iPad.